We’re having SUPER weather in San Diego that would make it the perfect host city for the event that’s going on in Indianapolis today. Sunny warm weather, 55,000 hotel rooms and thousands of restaurants and the NFL won’t give us the time of day. Why? Because we have a 45 year old stadium. I’m hoping we can get a new venue without costing the taxpayers and be hosting the bowl in a few years. I have a new team of fellow Yakezie members and challengers and am highlighting my favorite articles from the group this week. The Debt Myth shares the importance of looking at the overall picture occasionally. If you’ve already slacked off your 2012 resolutions and goals use these tips from Money Q and A to get back on track. One Cent at a Time discusses ways to calculate how much to save for retirement. Are you saving enough or too much? Learn about researching stocks from Thirty Six Months. Smart Money Hacks reveals that not everyone needs to file a tax return. Are you one that doesn’t? Learn how to get a refund without losing your dignity at The Frugal Toad. Newlyweds on a Budget discusses balancing saving money with traveling. Jai Catalano Photography shows us that most pictures we see are an illusion with a great photoshop example. Thanks to the following sites for highlighting articles published here. They have excellent articles included. I’ll be posting another declutter giveaway later today so come back, but to get you started enter these giveaways hosted by personal finance bloggers. Little House in the Valley is hosting a Ghirardelli chocolate giveaway. Entries are open until February 10th. Prizes include the Rich Dad board game and a $25 Amazon gift card at Family Money Values’ giveaway. Enter by February 12th. Budgeting in the Fun Stuff also has a Ghirardelli chocolate review and give away. Leave your comment by February 12th. All high heel lovers, enter the memory foam cushion pads giveaway at Well Heeled Blog. Entries close February 9th. Super Frugalette is giving away a $50 Starbucks gift card! Enter no later than February 14th. Help Tight Fisted Miser celebrate the blog’s fifth birthday by entering the giveway for a whole bunch of personal finance books and a $5 Amazon gift card. Enter by Wednesday. Couple Money is giving away two copies of TurboTax Deluxe Online to help you file taxes. Enter by February 9th. Enter to win the cold and flu package at Surviving and Thriving by tomorrow night. It’s good to be prepared! Frugal Beautiful is giving away The Lovely Box (makeup) to five winners! Enter by February 9th. You get another chance to win Ghirardelli chocolate at The Family CEO. This one ends February 1oth. Financial Success for Young Adults is celebrating a blogiversary with $150 in gift cards. Enter by February 11th. Enter to win a $25 Amazon Giftcard Giveaway at Retire by 40. You have until February 19th to get entered. Wow your weather is fantastic! It’s been a great winter so far. We usually have more rain this time of year. Thanks for the mention Kay! Someday I hope to make it to San Diego. Your weather now sounds amazing. Thanks for all of the good giveaway links. I am off to enter some of them. . . The weather is all over the place here. 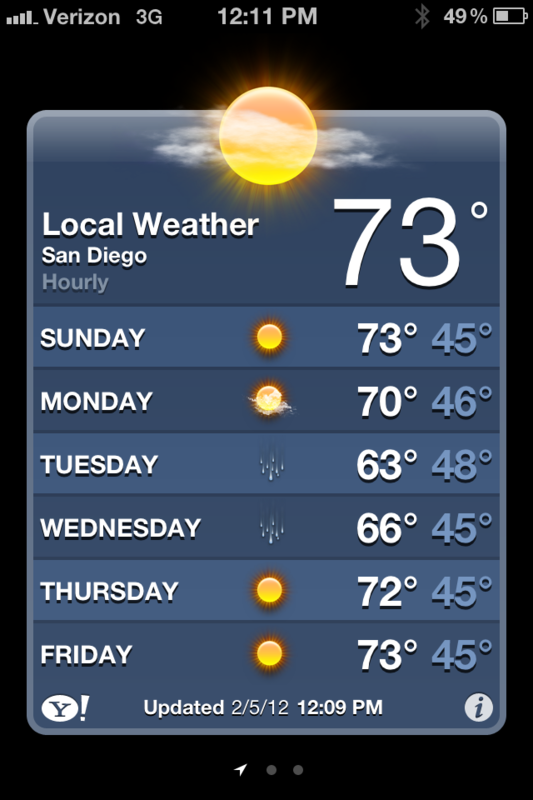 I wish it were 73. Thanks for including me in the round up.